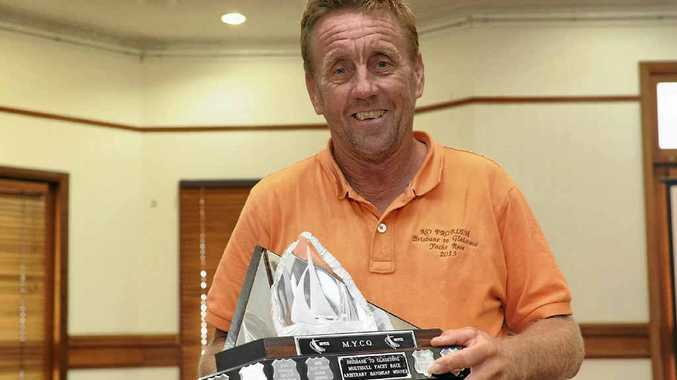 No Problem owner-skipper Ray Hobbs is happy to win the multihull performance racing division. THE sails have been furled on another successful Brisbane to Gladstone Yacht Race. The 65th year of the sailing event was a big win for the local sailing community, with Gladstone crews placing in numerous divisions in the multihull and monohull events. Regular entrant Wild Thing won overall line honours. Port Curtis Sailing Club member Marina Hobbs said the club excelled in this year's race. "We featured in the top places in numerous divisions which is fantastic," Hobbs said. "It's been a very successful race for our club." There was great celebration when Gladstone multihull No Problem won the performance racing division. Skipper and owner Ray Hobbs said it was a good fun race with plenty of variety. His said all Gladstone crew was well qualified to meet the challenges along the way. But Ray said fun was at the heart of the event. "Half the fun of the race is being able to compete against the other boats from Gladstone." The celebrations continued at the monohull presentation on Sunday, with Gladstone boat Immigrant taking second in the performance handicap, first in the ORCi category, the Noel Patrick memorial trophy for best placed Gladstone boat and third overall in the The Courier Mail Cup. Immigrant skipper and owner Jeffrey Paul said it had been a challenging race. "It was highly practical and required hard work all the way," Paul said. "I'd like to thank my crew of international and local sailors." The Courier Mail Cup was presented to Wedgetail skipper Bill Wild for best overall performance. Gladstone Mayor Gail Sellers commended the local crews on their achievements. "It was a long race, but with some exciting moments," she said.